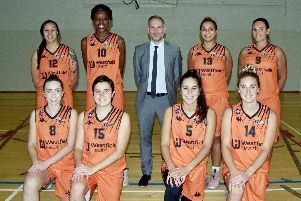 Sevenoaks Suns held onto top spot in the WBBL Championship as they held off Westfield Health Sheffield Hatters in a top three battle. The Hatters had won on Friday night but were unable to inflict a second loss on the Suns - who stretched their advantage over Leicester Riders. Having trailed at the half, Sheffield edged back ahead at the end of the third and led 69-70 with 4:47 left only to be held scoreless as a 7-0 close gave the hosts victory. The Suns kept their composure at the foul line as they converted 12 of 14 free throw attempts with Sheffield shooting 58% as Sevenoaks closed out the win. Leading scorers: Fritz 19, Carr 13, Pressley 11 (Suns). Gregory 19, Gandy 16, Woods 15 (Hatters). Westfield Health Sheffield Hatters continued their winning run as they defeated Oaklands Wolves 79-60 on BBC Sport. The hosts made it five straight league wins to move to a 13-4 record as they strengthen their grip on third spot. The Hatters were dealt an early blow with an injury to Helen Naylor and they trailed early in the game before turning things around in the middle periods as they outscored their opponents by 20. Oaklands gave up 26 turnovers in the contest which were turned into 23 points for Sheffield - who also claimed 21 offensive rebounds. Jen Ashton came close to an impressive triple-double after finishing with 21 points along with 10 assists and 8 assists, while Gianna Woods posted 19 points and 16 rebounds in the win with Steph Gandy also adding a double-double with 13 points and 10 boards. Leading Hatters scorers:Ashton 21, Woods 20, Gandy 13. Scores after first three quarters: 14-21, 40-37, 60-47.